Satire: A New Way to Combat the Crisis? In an age where anonymous dissent is celebrated, the Pope is not immune: satirical criticism has swept through Rome in recent weeks. Now it has been learned that an earlier, but similarly-organized operation took place about a month ago. Cardinals awoke to the reception of a news bulletin, seemingly from L'Osservatore Romano, in their email inbox. This satirical message, made to look as if it came from the Vatican news agency arrived with the subject "Ha risposto!" (He responded). The fake email reported that Cardinal Christoph Schönborn of Vienna, known to share the Pope’s views on the divorced and remarried, had reviewed the responses positively, while no comment is offered from Cardinal Gherard Müller, who as head of the Congregation of the Doctrine of Faith, would ordinarily be given a voice on these subjects. This silence from Müller is due to the Pope “benevolently spar[ing] him the honor of expressing an opinion.” Monsignor Pio Vito Pinto - who in the past suggested the Pope could remove the cardinal's hat of the dubia’s authors - is reported of dying of joy after reading the Pope's answers. To be abundantly clear, the contents of this email are intended to be satirical and amusing to a point. But what is real (and where the humor ends) is the sweeping sense of unrest throughout the Vatican. Of course, many are pointing fingers towards traditionalist Catholics. 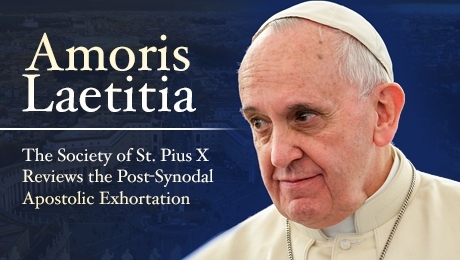 Cath.ch, a Swiss Catholic news website, could not help but speculate that the St. Pius X Center (responsible for the publication of SiSi NoNo, an organization independent of the SSPX), was responsible for the email. John Allen in the February 10 edition of Crux celebrates the humor of the piece. 'Satire may be mad and anarchic, but it presupposes an admitted superiority in certain things over others; it presupposes a standard.' wrote Chesterton." And again, we could laugh too - if the subject was not so dramatic, if the person and function of the Pope were not involved, and if all this was not an expression of the chaos in Rome. Is This a Proper Way to Combat the Crisis in the Church? Further, and as we have touched on before, we cannot support this passive-aggressive and disrespectful method of "correcting" the Sovereign Pontiff. While privacy and confidentiality are not without their place, hiding behind a computer screen has, unfortunately, become an accepted method of public discource. Letters sent without signatures, anonymous emails, and posts on websites using pseudonyms are not done by men of fortitude and conviction in the truth. They are the acts of cowards, who like the mythological figure Eris, only seek to attain their goals - however noble they may be - through chaos. It would seem an unnecessary statement in a daily press briefing, akin to a mother telling her children during meal time, "I support your father's decisions wholeheartedly" without prior context or reason. But today, it is unsurprising, as an exceptional barometer of the havoc inside Vatican City during this pontificate. Cd. Muller Tries to Clarify "Amoris"